The computer called for a high at this time a year ago. There is nothing new. The same old news of QE3 will be inflationary is just nonsense. We have massive deflation still going on. The key to watch is interest rates. Do a simple correlation and you will see that inflation requires rising interest rates – not declining. 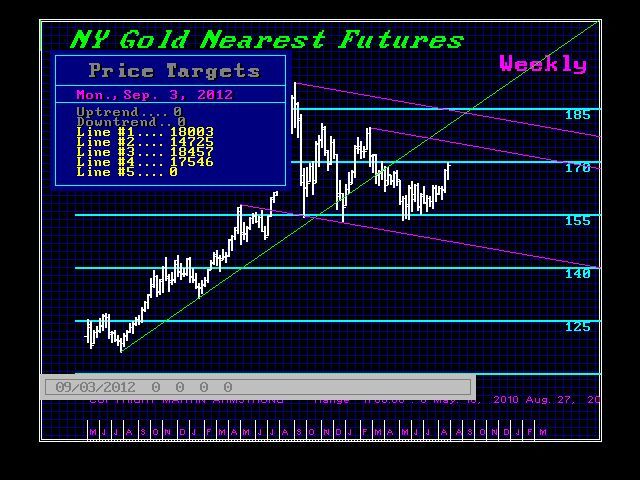 However, government is making the perfect mistake to set that stage for the explosive rally in gold. The Fed last year bought 61% of the new debt. That may appear to be inflationary from one side of the coin, but capital is contracting due to the witch hunt for money globally, the continued decline in bank assets, though starting to ease with real estate, and the massive increase in taxation. Even the banks are all moving their back offices now to Poland and India. That even includes banks in Singapore. Once capital realizes that these trends are forcing it to invest, then you will see assets rise, debt will fall because interest rates are so low, people are not buying other than very short-term. Americans are being chased out of all banks worldwide, The government figures that capital will be forced home and then they can imprison people and confiscate that wealth. Sorry! The solution is to buy assets outside of the banking system – real estate, stocks, & gold (not in France). As capital shifts from banks and public assets into private, then we will see the inflation come home. That appears to hit in 2014 and we will see an explosive move to the upside thereafter. Hence, QE3 is only a confirmation that the trend is still contracting. It will be no more inflationary than QE1 or QE2. The danger these morons are creating is that with interest rates so low, they are likely to find NO BID for the bonds when they do need the cash. Then watch what happens! These morons will have created an explosive inflationary spiral. That takes place ONLY when capital shifts away from PUBLIC assets into PRIVATE and sees the light. For now, gold may peak this week by the 7th. The key weeks are 9/17 and then 10/1. We will see volatility rise in October. Europe is still messing things up. Politicians are clueless and still think they can bully the private sector into paying their bills. They will have another thing coming very soon. For now, the main resistance in gold is at the 1800-1810 area. This is purely a technical move. A low early next year should complete the normal 2 year correction process and from there we will be in a position to change course. The same turning point that the 1987 Crash was on in that 1989.95 wave will be next August. From there onward, a change in trend appears highly likely. We will be providing the specific targets for the next year with all the Reversals and Cycle Maps at the San Diego Conference 9/23-24.This is going to be a very important event. « Obamacare – The Death Squads maybe real.